Closed my long at 12183.5. This market is getting interesting. I have a long position which I opened at 17:23 (GMT+1). The price action is making a break out attempt from the correction channel (drawn on the 1 hour chart). If it will be successful it will be the base channel of the upside movement. The market is reaching the neckline of the inverse h&s pattern at this moment. I closed my dax long at 12128.5.The resistence is near and this market is still ranging and there is no evidence of break out yet. The market rallied from yesterday's low in a parallel channel, which suggests that this upside movement is part of a correction. 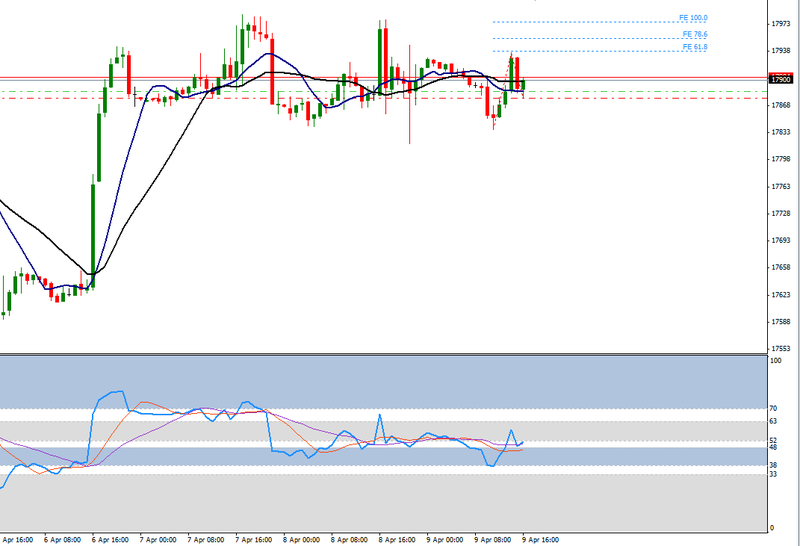 The minimum target zone for the bullish cross on the 1 hour chart's RSI was reached. I can't rule out that the market will make a temporary top which should be at least a wave b of (x) and the wave c will fill the gap left open after the holiday break. That's just a thought, there is no sign of reversal so far. In case of a break out from the correction channel, the market might reach the neckline or even test ATH. DJI30 got stop out. 40 point (2R) in the pocket. DAX long's SL raised to 12108. The U.S. opening looks awesome so far. DJI30 longs closed. 38 point profit. I just opened a long. The momentum on the 1 hour chart produced a bullish cross. Hopefully the test of the channel is finished and the bearish slingshot will be null soon. I just got back. I opened a 2 long DJI30 on my cellphone. I'd like to see a test of the upper zone of the range. I got stop out. I think this is a deep channel test. Opened another long. For continuation of the upside movement the 1 hour momentum shall create a bullish cross. My long is still on the market. I think this is a test of the correction channel. It might get trickier though and retrace a little deeper. I opened a long position on my way. I hope this wave at least is going to attempt to reach the neckline of the inverse h&s and reach above Tuesday's high.